Now, for the first time, the beginning farmer can succeed with a market garden business and achieve business profitability in a reasonable time frame and with minimal investment capital. When most people think of farming they envision vast expanses of land with neat rows of stalks of corn or wheat, as far as the eye can see, swaying in the a warm summer breeze. They also envision huge tractors tilling the soil. Well in New England, this image is rapidly changing to encompass a totally new approach for “market gardening” operations; an art that was largely lost in the 1900’s due to farm mechanization and straight line farming rather than hand tended vegetable production. In this article we will meet a new kind of farmer that is on the forefront of helping change the face of farming as we know it by reestablishing the lost art of market gardening. You will learn about a newly emerging methodology that guides beginning farmers with the production of fresh mixed vegetables. Using intensive organic soil management practices and a number of specific processes, today’s new farmer can establish a market garden business that encompasses production, marketing and sales operations. Now, for the first time, the beginning farmer can succeed with a market garden business and achieve business profitability in a reasonable timeframe and with minimal investment capital. Brenda Sullivan of Thompson Street Farm in South Glastonbury CT is Connecticut’s first SPIN Farmer and one of New England’s first SPIN farming educators. SPIN stands for Small Plot IN-tensive; an acronym that highlights the nature of market garden farms. SPIN represents a totally new approach. The “packaged solution” was created by SPIN Farming LLC (www.SPINfarming.com). It consists of a “cookbook” of methods, tools and training that guides beginning farmers in creating highly profitable backyard market gardens. In essence, SPIN transforms lawns into highly productive food production sites. Brenda’s farm is a great example. Her backyard and a number of other small plots of land are now in full production. These are parcels that commercial farmers may have considered to be unproductive or unusable. Brenda first learned about SPIN Farming while searching on the internet in 2009. She discovered a video explaining what SPIN Farming was all about and how adaptable it can be for anyone’s skill level. From there she was hooked. SPIN Farming is based on a multi-site plan that utilizes people’s front and back yards and other small plots of land that are usually less than an acre in size. In an urban setting, the potential parcels could be parking lots or vacant lots where a house once stood. Brenda purchased the SPIN farming series of manuals and began to apply many of the techniques right away. Soon, Brenda discovered she could start “farming” right in her backyard. Her first year she had 11 raised beds in production. 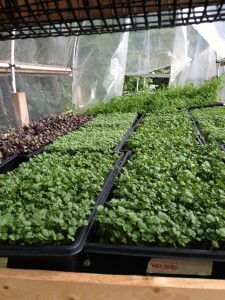 By the end of her second season, she had a total of 22 raised beds, as well as a 14 x 25 foot green house and two specially designed greenhouses that were built for the production of microgreens. By year four, opportunity knocked, once again, as Brenda was approached by the Glastonbury Great Meadows Conservation Trust to farm their land which added 0.2 of an acre to her production site portfolio. Relying on the newly acquired education that she received through SPIN, Brenda knew that she was on the right track; getting buy-in from other land owners to turn their parcels into productive market gardens without having to spend hundreds of thousands of dollars. Later that same year, Brenda was approached by a 4th generation farmer who was interested in putting ¾ of an acre back into production. He asked if she was interested and she jumped! By the end of the 4th season, Brenda had 3 primary locations… each with their own unique challenges and opportunities. Each plot had it’s own micro climate which required tactical decisions such as the selection of crop types, seed quantities and “relay” (re-planting) frequency. By using basic SPIN strategies, she was able to determine what to grow and how to manage her time and land. For example: plot 1 was her backyard and everything was to be grown in raised beds. Her backyard’s cooler micro climate enabled her to place her highest value crops, small leafy greens, there. 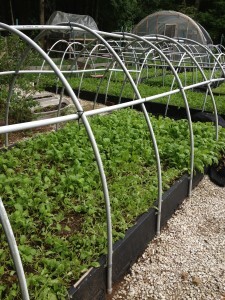 Raised beds with high hoop tunnel framing. Her second plot, (0.2 of an acre) was along the Connecticut River and was a huge challenge for her. Conventional corn had been grown there for generations. In addition, the soil was fine silt and the area was prone to frequent flooding. The previous year the entire meadow lands were devastated by 2 hurricanes and 1 seasonal spring flooding, so soil health was a concern. Her third plot (3/4 acre of dormant farmland that once grew tobacco) had soil that was sandy loam and had no access to water. However, the farmer was willing to plow for her which was a huge help in the physical labor department. Taking into consideration all three micro climates, Brenda had to figure out what to plant on plots 2 and 3. Using her SPIN knowledge, she calculated her work flow and work rates. These are critical components underlying the SPIN approach. She knew she couldn’t easily grow leafy greens on plot 2 and 3. Thus, after calculating everything needed she determined she could only allocate a certain portion of her time per week at plots 2 and 3. Her decisions took into account many factors including equipment, traveling time to and from her home, the time needed to harvest, clean and prep produce for farmers markets and make wholesale deliveries. Therefore her crop selections were made on the basis that the produce would need less care than others. The SPIN methodology encourages farmers to think outside the box and be creative when solving problems. For the new farmer, with no prior agricultural background this is an important factor for controlling costs. Brenda also realized that she could tap into the SPIN farmer network for unparalleled mentoring. Once her plots were cleared and sections planted, Brenda had other challenges such as developing irrigation strategies, managing weed prevention, marketing, pricing and others. Brenda made her share of rookie mistakes, but at the end of the season she had sufficient produce from all three plots to sell at all of her farmers’ markets while also supplying her wholesale accounts with great fresh gourmet-quality vegetables. Eureka! Based on having succeeded with the SPIN farming approach, Brenda is now helping others to adopt the many new practices and processes that SPIN is becoming known for, globally. Brenda offers a 1 day intensive SPIN farming workshop for those people who are serious about market gardening and who understand the importance of achieving business profitability in record time. Brenda is also adding her own “spin” on SPIN by exploring other complementary farming practices and revenue sources! For instance, this past fall, Brenda made a strategic decision to partner with a newly emerging start-up company called FRESH Farm Aquaponics (www.freshfarmct.org) based in Glastonbury, CT.
Aquaponics is the integration of aquaculture (raising fish in a controlled environment) with hydroponics (growing plants in a soilless media). 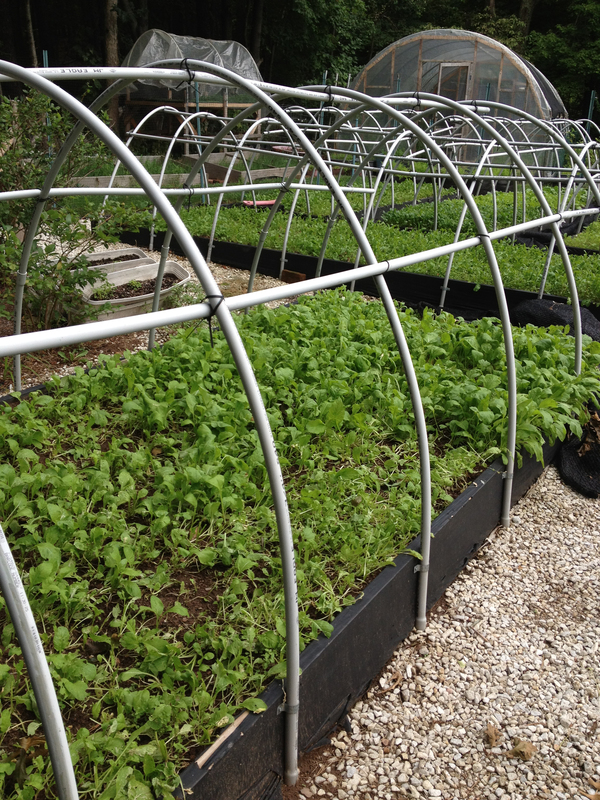 Aquaponic systems are completely contained above ground and are self-sufficient. Brenda and Spencer Curry of Fresh Farm Aquaponics are now building a 3 part curricula that spans SPIN farming, aquaponics, and a hybrid approach to integrating these two exciting farming dimensions with greenhouse production. 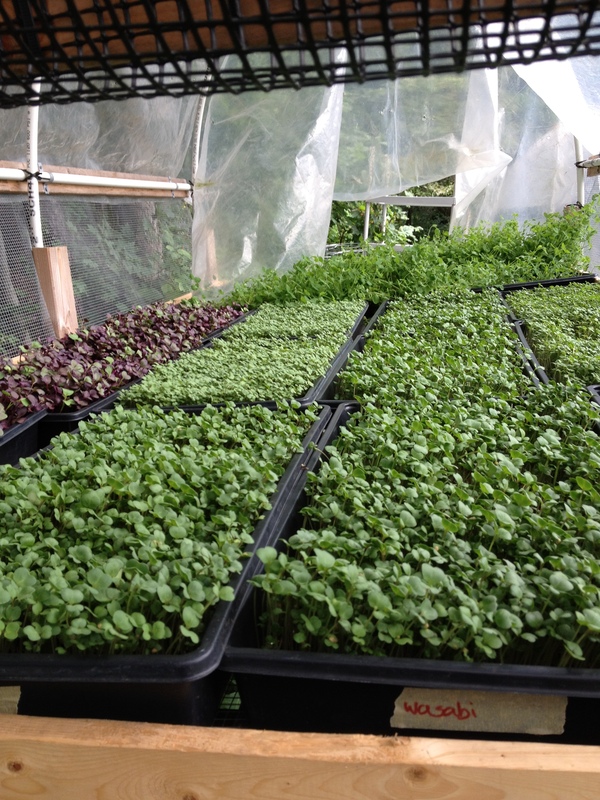 Brenda and Fresh Farm Aquaponics are opening new doors for prospective farmers across New England who want to tap into proven practices, processes and approaches but who may have no practical experience, nor large pools of investment dollars. Brenda Sullivan can be reached at brenda@thompsonstreetfarm.com or check out her website and blog at www.thompsonstreetfarm.com. Wonderful article! It’s great to hear that SPIN-Farming is finally coming to New England.